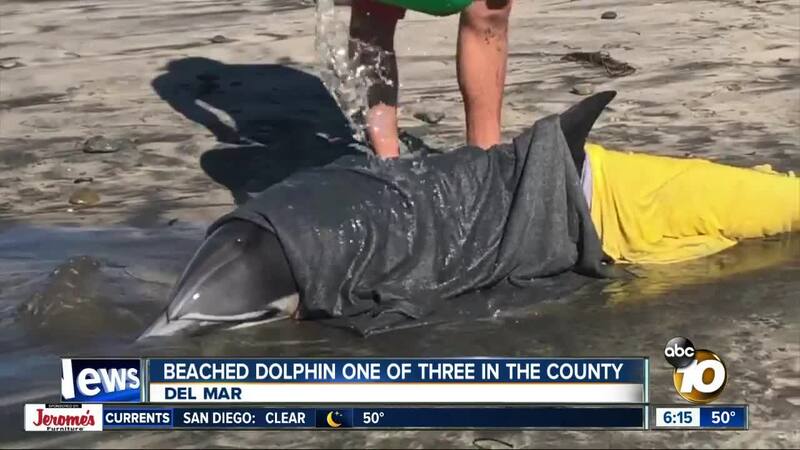 SAN DIEGO (KGTV) - Three dolphins washed ashore at separate San Diego County beaches Monday morning, likely due to the high surf slamming the county’s coastal areas. 10News learned some swimmers spotted a dolphin that had washed ashore at a D Street Beach in Encinitas at around 8 a.m. The swimmers were able to help the dolphin back into the water before lifeguards arrived. About three hours later, in Del Mar, numerous beachgoers spotted a dolphin on the sand near the 17th Street lifeguard tower. The dolphin, which appeared to be bleeding from its mouth, was doused with water and had a towel draped over it as SeaWorld officials were called to the scene. 10News learned the dolphin died from its injuries. At around 12:15 p.m., lifeguards saw a dolphin beached at the Children’s Pool in La Jolla. The lifeguards helped pull the dolphin back into the water and it swam away safely. Lifeguards believe the strong tides are a likely factor in the dolphin sightings at the beaches.